Wow, no wonder why he had so much trouble in the NFL. When most of your reads are pre-snap, it must be a shock to deal with the advanced reads in the league. 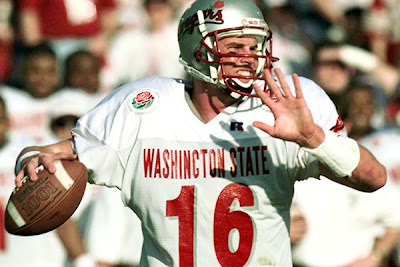 A minor correction: Wazzu vs. USC in 2002 technically wasn't an upset, since Washington State actually was ranked higher in the AP than USC (#20 vs. #18) and since the game occurred before USC entrenched itself as the megalodon of the Pac-10 (the previous season yielding a measly 5-7 record). Chris, a little nitpicking, but Spurrier did not call that combination "Mills." Mills was basically the same thing, except the curl was a dig. Leaf has a scheme that wasn't really widespread at the level he played, and it kept him ahead of the competition. The NFL changed it because he had tighter windows to throw off press coverage. Manning in the same draft, with a bevy of all world speed on the Vols.